Our Leasing agent, Dee Bourne will be happy to make an appointment to show you any property we have available! Are you looking for a home, apartment or duplex to rent? 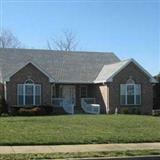 We have a large selection of single family homes in all areas of Clarksville, TN and surrounding areas. Are you looking for a dependable Management Company to manage your home to assure qualified renters and regular maintenance and care of your property? Cherokee Property Management's Team of licensed and experienced Real Estate Professionals will be at your service, whatever your needs may be. Please view our list of available properties! Call our office at 931-552-1891 to schedule a showing!